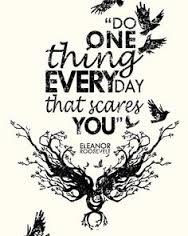 “Do one thing everyday that scares you.” Well maybe not everyday! But yes, more often then not. Why? I do not think that this arrangement is by accident nor is it some sort of twisted joke played on us little humans. Fear lurks at the “threshold of bliss” because we will do all we must to get through to the other side, to answer this call of our soul. We will meet fear head on because we have no alternative and in this true meeting we will discover that fear is an ally. Fear, like everything, is made of love. Fear wants to be transformed into love, to be sent home to love. Fear invites us to grow, to stretch, to love that which we have called unlovable. What power we reclaim in this alliance!